Winter is brutal. Icy winds blow through your useless coat, chilling you to the bone. Your car might be smothered under a thick layer of snow, and your hands, already numb from shoveling snow off the driveway, will be as frozen as the icicles hanging down from your roof. When the world succumbs to darkness at 5:00 PM, where do you turn to for some warmth and light? Here’s some advice based on my own experience living in this post-apocalyptic nightmare: step inside Little Sheep Mongolian Hot Pot in Edison, NJ. No – this is where the magic of hot pot happens. 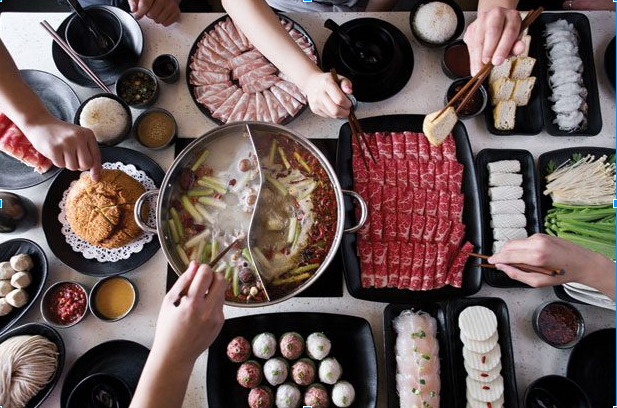 Hot pot is a traditional Chinese dish typically enjoyed during the winter, and involves preparing a simmering pot of soup and placing all kinds of foods, from lamb meat to fish dumplings, into the pot to cook at the table. Ready to get started? First, choose a soup base. In addition being a well-known chain in China that has now expanded to over 30 different locations in the U.S., Little Sheep celebrates central Mongolian traditional cuisine by offering two different soups: a simple broth with goji berries, jujubes, black cardamom pods, ginseng, and herbs; or a spicy red broth with chili oil and peppercorns. If this is your first time, I recommend the half and half pot with both soups. Now, it’s time to pick what you will be cooking inside of the pot. There is a wide variety of meats, vegetables, seafood, and noodles — don’t be afraid to try new things and order away! As a four-person family, we typically order lamb, beef, the seafood combo, fish balls with roe stuffed inside, fish tofu, beef tripe, spinach, napa cabbage, enoki mushrooms, crab sticks, pumpkin, taro, glass noodles (long, silky noodles that dissolve in your mouth), and egg dumplings. You can also order sides like the sesame pancake, which is satisfyingly crunchy on the outside and has layers of fluffy, soft bread inside, or the sesame balls, filled with my absolute favorite — sweet red bean paste — for dessert. After you order, head over to the sauce bar. The sauce is a key component to eating hot pot, as the food cooked in hot pot typically lacks in flavor. There are several sauces available; the most popular being sesame paste and sha cha sauce, which has the tang of barbeque sauce and the hearty base of Italian meat sauce. Feel free to mix and match, and sprinkle a few green onions on top at the end. By this time, the broth should be boiling and ready to cook all the delicious food you ordered. As a few general guidelines, Little Sheep recommends 10-15 seconds in the pot for thin sliced meat, 1-2 minutes for green vegetables, and 3-5 minutes for all other ingredients. Here’s a tip: the spicy broth cooks faster than the regular one. As you savor the last bits of a taro that dissolve in your mouth or break open a fish ball filled with roe, you’ll watch everyone, from your annoying five-year-old little brother to your beloved 75-year-old grandmother, join in on the fun of cooking their own food. Don’t worry if you have a “food baby” by the end of your hot pot journey; treat this meal as a reward that you deserve after all your hard work studying for tests, writing papers, and preparing presentations during these last few weeks leading up to winter break.